Beauty Queen‘s debut EP, Out of Touch, is out next month on Sleep Well Records. In the meantime, check out her new single, “Sold You Out,” as well as our interview. You might have noticed that we here at HighClouds have been a bit enamored with Beauty Queen this year. As of this article, 2019 has seen us average about one Beauty Queen post per month — first premiering her debut single “Goner” in January, then Thunderclapping second single “The Only One,” and now interviewing her about her upcoming project. Today we’re treated to the latest taste of her forthcoming Out of Touch EP, out April 19 on Sleep Well Records. The new track is called “Sold You Out,” and it’s another lovely, hazy daydream of a tune that will have you swaying your head and humming the melody into the evening. 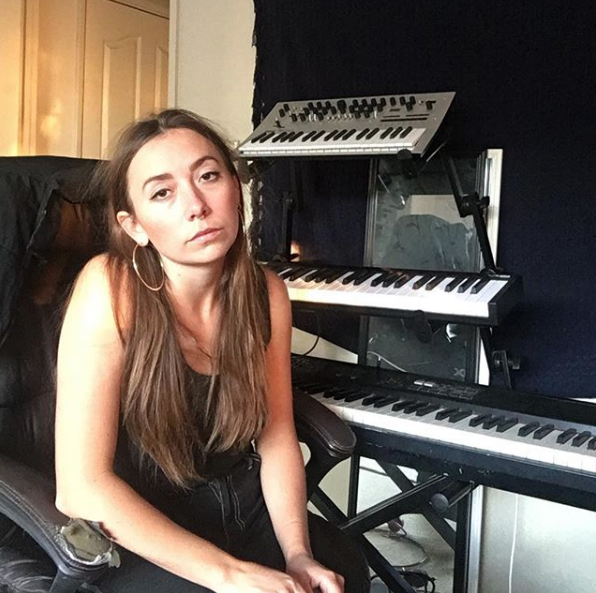 We recently had the chance to chat with Maui-born, LA-based Katie Iannitello – the delightful, genuine, humble, and multi-talented songwriter behind the Beauty Queen moniker – about everything from wedding singing to hotel pastries. Check her brand new single and read some of our interview below. HighClouds: Let’s start by talking about the name of your project. It’s an awesome band name and we’d love to hear more about how you came up with it. Katie: I was playing Cha Cha in Grease the musical, and I was very into the 50s glam kind of thing, and there’s also the “Beauty School Dropout” dance. With Beauty Queen, the music first started out being kind of surf-rocky and more in that 50s world. Now it’s gotten more contemporary, but the name still sticks. And women are beautiful! Agreed. Women are beautiful and should definitely be running the world. Since we’re talking about your older style, did the first couple songs on your Bandcamp page come from the influence of being in Grease and you’ve since gotten interested in other things? Or is that how you foresee your project — being something where you can change the style up as you want to? My goal is to release a bunch of different things that have different vibes, so I’m working on how to do that but still have it all tie into the music. I don’t want every release to be insanely different cause then it’s hard for people to figure out who I am. At the time I was really influenced by the Shangri-Las and other girl groups. “Blue Bayou” was the first song I ever wrote, so to start off with that piano-plinky, doo-wop thing was an easier way to navigate the songwriting world. Also, I started my project with a boy that was from a different band, and his style of recording had more of a grungey vibe, and I realized I wanted to take the project on a more pop route. So I moved to LA and started working with Henry [Henry Nowhere of Day Wave] who produced the new EP. How did you get hooked up with Henry Nowhere? When I was living in Oakland, I was playing a lot of jazz and singing at a bunch of little jazz clubs. I met a really good friend of mine — he’s a guitar player — and I was telling him that I had a pop group, and he said, “My friend Henry used to play jazz, but now he’s in LA doing pop.” So he gave me Henry‘s phone number, and I said, “I have these songs, do you want to listen to them?” Then he asked if he could produce them, and he did, and he’s so incredible at everything music. So it was when you moved to the Bay Area that you started writing songs? Yeah, I moved to San Francisco with no direction and worked for some theaters [doing set design work]. I grew up playing classical piano, but there aren’t a lot of shows on Maui. My first concert was when I was 18, and it was Journey! But in San Francisco, the local music scene is so easy to attend. So I just reached out to this band and was like, “Hello! I just moved here! I tried to write a song! Do you wanna get together?” Little did I know then what an insane, weird Facebook message that would be to receive. [Laughs.] I was just kinda going for it! And that’s how I started the band. You’ve got experience in a lot of different music styles: jazz, musical theater, classical, pop from many eras. Do you still do much with those other genres? I read somewhere that you taught piano and sang at weddings — do you still do much of that? I gave up the wedding singing. Maybe one day I’ll do it again, but I was kind of catapulted into a world that I didn’t really want to commit to. Jazz, sometimes I’ll go to sessions down here and sit in and will sing. I’d like to pursue jazz for regular gigs. And my friend and I started a country band, but the older, more jazzy country songs like Hank Williams, Anita Carter, and Patsy Cline kind of stuff. We’re just covering them and hopefully will start doing some gigs cause I love that kind of music as well. It’s funny you should mention the country band cause I’ve definitely noticed kind of a country influence, especially in your vocal style. So I’m curious — what are some of your absolute music obsessions? Artists or bands where you’re in it for the long haul with them. Well, a lot of the bands that are my favorites are older, so I don’t know if you want to hear about them. [Laughs.] But, Bobby Caldwell is really great. He’s real cool. Michael Rault, he’s newer. He’s great cause he has an old school influence, but his music is a cool mix between the really groovy stuff with the more monotone singing that the hip people do nowadays, you know? And then my all-time favorite man, who’s no longer with us unfortunately, is Gene Pitney and I love him. Let’s see… have you heard of Hatchie? She’s so cool! I love how some of it is so 2000s! Can you describe your songwriting and recording process? So you don’t start with a story or concept or even a feeling – you’ll let the improvisation of the vocals dictate certain words, which then dictates the ultimate story or song? Yeah! And what’s weird about that is, I’ll listen to it later on and think, “Whoa, that totally describes this one situation I was in that I felt strongly about.” My subconscious, you know? What would you say was the biggest challenge for you in making the EP? And what surprised you the most? Did you find that you learned anything about yourself through the journey of making this music? I think I don’t give myself enough credit for musicianship, and being in the loop with the people that are producing it. At first my confidence was really low, but then I realized that I could be a helpful part of the conversation and work together to arrange the songs. So I learned that I’m slightly more of a competent musician than I had previously thought. But I’m still working on that. [Laughs.] It’s very hard. I’ll be working on that forever. Correct me if I’m wrong, but we do hear a dog barking in “The Only One,” right? That’s Henry‘s dog, Penny. We recorded the EP in Henry and his girlfriend’s bedroom. It was all recorded in a bedroom. It sounds pretty good for a bedroom. [Laughs.] Except for the dog bark, but we kept that in cause it’s pretty cute. I’m trying to do something in July where we go all the way to Vancouver. So that would be fun. I’m working on that right now. And then I’m trying to tour with some other bands, hopping on a couple as an opening act. One last question. 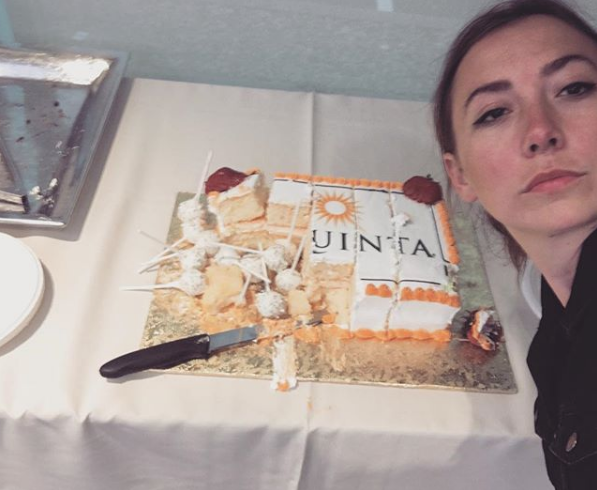 You have an amazing Instagram page, and I just have to know what the story is behind the La Quinta cake. They just had a cake that they made with their logo on it? !